Want to accelerate your mojo? Do you struggle to make the right decisions in life, or worry you made the wrong ones? Are fear and doubt stopping you from having the awesome life experiences you want? Do you want to know the true purpose of emotions, and feel totally comfortable being who you really are in the world? Join this FREE, online class today to get started on your greatest inner transformations. Imagine the relief you'll feel when indecision, doubt, and self-judgement are no longer part of your creative process! Following these seven, simple steps are the foundation of true emotional freedom, empowered living, and turning thoughts to things in an effective, enjoyable, accelerated fashion. This introductory class takes a deep dive into the first of a seven steps process to getting your desired Accelerate Your Mojo transformations. Get to the root cause of emotional discomfort and the real purpose of emotions. Know, without a doubt, what your next best decision is in any situation and finding the strength and certain to make it. Use fear, doubt, and anxiety as the guidance they're designed to be instead of excuses not to move forward. Become comfortable with who you really are and learn to shine in your uniqueness. Drop feelings of anxiety, fear, and self-doubt by the wayside for good. Understand why problems and challenges are diagnostic tools for positive transformation, instead of reasons to feel defeated. Learn to be selfish in a way that benefits both you and those you interact with in life. Clarify your true spiritual nature, making this aspect of yourself your most cherished relationship. FYI: You can take a quick self-assessment in this free e-book, or directly in the course, to determine if this is the right course for you. Chances are good that at some point, in the not so distant past, you've asked for an easier, more effective way to know whether or not you're making the right decisions in life. It might have sounded like, "What am I doing?! I'm so confused and frustrated!" It might have also occurred to you, in the midst of a recent struggle, that having a strategy for transforming off fear would have been handy. Or, perhaps when that wave of self-doubt, or self-questioning, hit, being able to move back into certainty and ease would have saved you hours of panic and tears. It might have sounded like, "Ah, I'm so freaked out right now! I feel stuck!" Or, perhaps you didn't go to that social event you planned on because you didn't feel like you belonged or had the right clothes to wear. It might have sounded like, "I don't want to go. I'm terrible at small talk. I never know what to say. I don't think those people really even like me. They look at me funny because of what I wear." 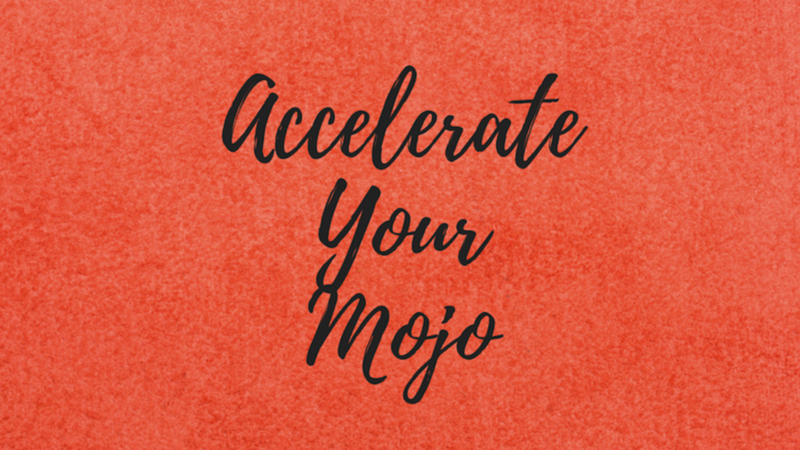 Click here to register for the Accelerate Your Mojo free class. Start transforming today. © 2017 Living 360, LLC.